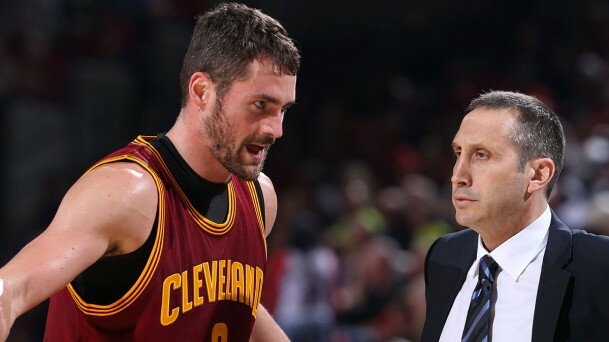 It’s bad enough for David Blatt that his rookie season as the Cleveland Cavaliers head coach seems to be heading in a very wrong direction, he now has to try and quell the flames from mentioning that Kevin Love isn’t a max player. So did he mean it directly or was this another case of the media making something out of nothing? According to Blatt, this was just him avoiding the whole tampering rules because Love is under contract, can opt out at the end of the season and all that. By the way, LeBron James is one the same side of the coin, with the option of leaving when this season, a rather disastrous one so far, is over. But maybe it was a moment of frustration with Love that came out exactly how it sounded? I don’t pay a lot of attention to social media but I think my comment was either misunderstood or misconstrued. I was simply saying that with our team, he does not have a max contract because we’re not allowed to talk to him about anything until after this season is over. That was really where I was going with that. So I think that’s very unfortunate the way that that turned out. That’s the way of the world sometimes. I guess I got to be clearer in my thoughts. I did mention it to him just because what I heard , but he had no problem with it. He understands as well as I do sometimes things get taken out of context or even maybe I just wasn’t clear in what I meant. But I hope now you understand exactly what I meant. Kevin Love, for me, is a player of the highest order, and whether you want to define that by max contract or any other thing, he’s one of the best players in the NBA, and that’s the way we value him. I just got to be clearer, that’s all. You live and learn. Kevin Love, also talking to reporters, didn’t seem to be actually bothered by the commotion, taking it in a rather humorous way. But quite often we’ve seen players and coaches react one way but actually pushing in a different direction behind the scenes. There was obviously a reaction. Not from me. I wanted to get the context of it all. But once I got the context and what he was talking about, he’s right. We can’t talk about anything about this summer or contracts or anything of that nature. So I just let it roll off [my back]. We had a great practice today, and more than anything, I just think it’s unfortunate that that’s what we’re talking about when we’re what, 1-8 in our last ninegames. So we need to win a basketball game or win basketball games here headed forward, so I’m not really trying to think about that too much. I had a short conversation with Coach Blatt. I know that things can be misconstrued, but it’s just the way of the world and it didn’t bother me none. The Cavaliers are at 19-19 since the start of the season, losing five in a row and eight of their last nine games, most of them without LeBron James, still out with an injury. Love is averaging 17.9 points and 10.5 rebounds per game, his lowest per game numbers since his second season in the league, also struggling with his shooting (44% from the field, 34.5% from beyond the arc). It’ll be a complete disaster if he or James (and obviously if both of them) opt out of their deals when the season is over, because the Cavaliers gave up their future for what they’re experiencing now.